All of our hats are made of braided palm leaves. In Guatemala, seven strands of palm are braided into a flat plait about 1/2" wide. 150 feet or more of this braid will go into a 4" brim standard palm hat. She is wearing the tradition Quiche "traje", or dress. Quiche is one of 26 indigenous languages spoken in Guatemala. Approximately 1 million people speak Quiche, more than any of the other indigenous languages. You can hear her speaking a native language. I presume it is Quiche, which is predominant in the department (state) of Quiche, but it could be something else. Do you know? Last year when I went to Guatemala I shot a lot of video of the hat making process. I hope to be converting more of it to a YouTube friendly format in the coming days and getting it it posted. I just got back from Guatemala where I took some videos of the hatmaking process: bleaching palm, the palm market, braiding palm, and sewing the hats together. Here are a couple of photos excerpted from the videos. Here's a Quiche woman braiding palm. I think the young apprentices were mostly eager to be photographed. The woman and older girl are dressed in skirt and blouse typical for Quiche women. The younger girl has chosen jeans and t-shirt for this day, but sometimes chooses "traje". Quiche is the largest of 26 Mayan ethnic groups in Guatemala, each with its own language. There are approximately 1 million Quiche speakers, out of about 6 million native speakers. The population of Guatemala is about 13 million. This is Marcelo Lux, working on a treadle sewing machine. He is 76 years old and has been making hats since he was 14. Watch for some video to be posted soon. After about an hour of boat travel through the mangroves we reached "Hawaii" with its black sand. The "barra" is long, but only a couple hundred yards wide, with Pacific on one side. 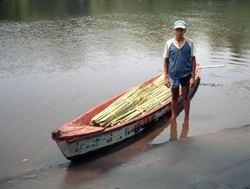 Palm harvesters, men and boys working alone or in pairs, leave before dawn in small boats to their harvesting spots. The young man in this picture was 15 years old when I took this picture. He said he had been gathering palm for 10 years. He had a younger helper. He said that good spots were hard find, so he went early, when it was still dark, to try and keep it a secret. The palm harvesters here are gathering palm near the mangrove swamps from palm trees that grow wild. 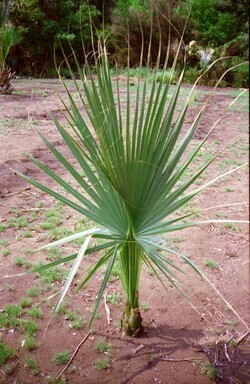 We hired a biologist to investigate palm growning and harvesting several years ago. She learned that the palm growing in this coastal area is under pressure from ranchers, who are burning the palm trees to clear land for cattle grazing, and from developers building vacation homes. Just after I started SunBody Hats in 1996, I made a trip to Guatemala to find out where the palm comes from that is used to make our hats. We travelled down to the Pacific coast, south and a little to the east of Guatemala City. We had heard of place called "Hawaii" (for its black sand), a barrier sand bar island, where palm was collected. We had to take a boat for several miles through a channel between the barrier island through the mangrove swamps. 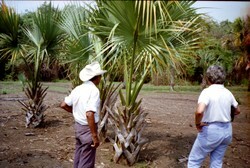 Our pilot pulled over to this spot where some palm was being grown. Here's a very young tree shown above. 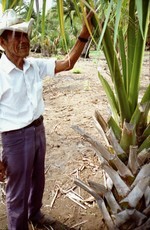 It was explained to us that the palm harvesters would cut unopend leaf shoots. The leaves inside, not having been exposed to sunlight, are still a very light yellow. They only turn green after the frond opens up. The harvesters will cut from a tree until the new shoots are too high to reach.